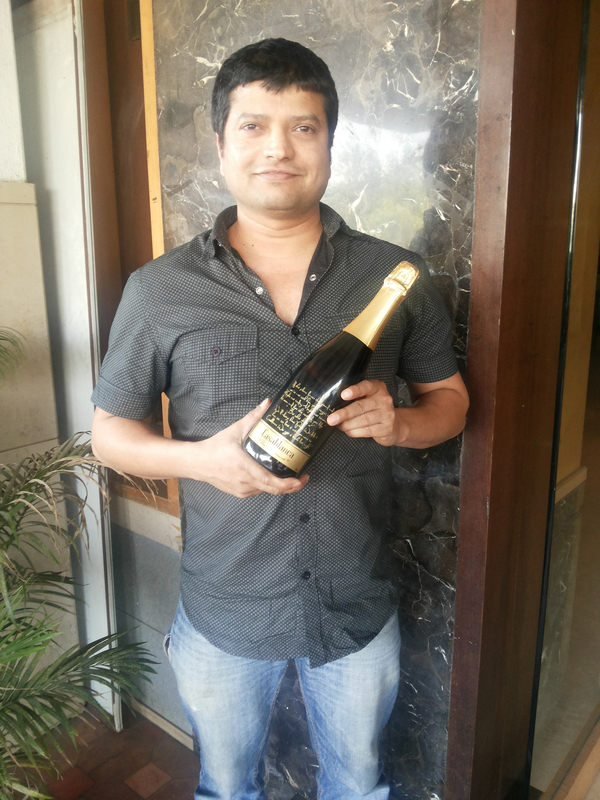 When I met Ashwin Rodriguez first about 3 years ago at the Mumbai Wine Festival at the Radio Club, he was enthusiastically showcasing his recently introduced bubbly Rio with pull-tab type closure in the bottle at around Rs. 100 a bottle with the hope of converting the young adults from coke to the low alcohol, low cost sparkling wine, reminiscent of coke. He claims to have made 3300 cases of sparkling wines in December alone, with 95% being Rio in 3 variants! He introduced Casablanca in December, a very palatable, easy drinking, fruity sparkler, making 800 cases of what he considers the first Charmat method Prosecco styled wine in India. ‘Joie from Chateau Indage was the first Charmat method produced sparkling wine in India. However it does not necessarily mean it was made in a Prosecco style,’ he says, adding the other similar wine ‘Sula Seco mentions "Methode Classique" on the front label. Thus the producer claims that secondary fermentation is done in the bottle and not by Charmat.’ Sula Seco is in fact an infused carbonated product and could be a competitor although it is in the Rs. 500-550 range. Ashwin is a Chartered Accountant by profession and went to Australia in 2005. He fell in love with wines and decided to set up a winery in India after training in a local winemaking school in Barossa Valley and learning to make wine and subsequently working with a couple of wineries. But he felt there was need for more sparkling wines in India and decided to start with sparkling wines and become an expert in sparkling wine making by starting with carbonated Rio. He built his own winery in the government- developed Vinchur Park in Niphad in 2013 with a 550,000 liter capacity with the tank hall big enough to increase storage capacity to 2 million liters and has engaged Yogesh Londe, a German trained winemaker. He says claims Casablanca is made from four grapes- Chenin Blanc, Sauvignon Blanc, Symphony (a cross between Muscat and Grenache Gris) and Shiraz. ‘Chenin Blanc gives it the front palate and aromatics while Sauvignon Blanc adds to its length and crisp acidity. Symphony gives it a floral nose while Shiraz holds the mid-palate, he says, adding ‘it is a fairly light but fruity, aromatic wine of medium-high acidity with a mysterious character. Also, I make my wine for the common consumer and not connoisseurs,’ thus explaining the slightly sweet character. Not surprising, when I opened a sample bottle he had brought to me , later in the Tasting room of York, I found it a bit too sweet but a few novices I tasted with, found it delicious. But won’t he find it difficult to sell at Rs. 850? It’s rather tricky to sell the wine in Maharashtra and Goa, my current markets with the unsustainable schemes offered by our competitors. The liberal freebies in the trade do make it an onerous task. Although he plans to bring out the wines made with ‘Methode Traditionelle’-where the second fermentation is in the bottle, giving it secondary characteristics and complexity (other producers are mostly using this process already), his target is to have a sparkling wine at Rs. 300-400 a bottle for mass consumption and compete with the alcobev segment and not necessarily the current sparkling wine segment which is high-priced. The generous use of Thomson Seedless grapes that cost around Rs. 20 a kg compared to Rs. 35-40 a kg for the wine grapes he sources from pan Maharashtra would help him bring out wines costing Rs. 400-450 next year, he says. He crushed 300 tons of grapes at his own winery this year and further 250 tons for Chandon-a third of their total crush. This indicates his relative position within the sector. In the meantime, he also introduced the Rose version around Valentine’s Day last month. Priced at Rs. 900 a bottle this is the latest move to woo the romantics. Our Mumbai Correspondent Rishi Vohra CSW and Asst. Editor of delWine Natasha Vohra tasted the wine together. Their tasting notes and comments: Light pink; very good mousse, predominantly ripe strawberries and vanilla on the nose; tasted truly 'swaad' with very creamy mouthfeel, like vanilla and butter cookies, good length. Not too dry, sweeter than most rosés so we wonder if they add something?’ Not bad for a debutante, especially when no tall claims have yet been made, except winning a Gold Medal in a Consumer tasting for the white. Seemingly, he has the pulse of Indian consumer and hence is on the right track. Ashwin has been doing the private labelling for Tito’s in Goa and also for Soul Tree in the UK. So if you like to taste his wines, try Rio, the two Casablanca labels or buy a Soul Tree bubbly in London or order a bubbly at Tito’s and decide for yourself how they stack themselves against Sula, Grover Zampa, York or Chandon costing between Rs. 950-1400 a bottle. Selling a total of 25,000 cases a year with Rio been the main bread earner, Good Drop Cellar is eyeing a respectable position in the mainstream Indian wine industry and certainly a key position in the sparkling segment. We wish him luck and say ‘Cin-Cin’!